Urban Oasis: Tag. You're it. Borf, the DC graffiti artist, was arrested Wednesday, turning out to be an 18 year old anarchist art student. 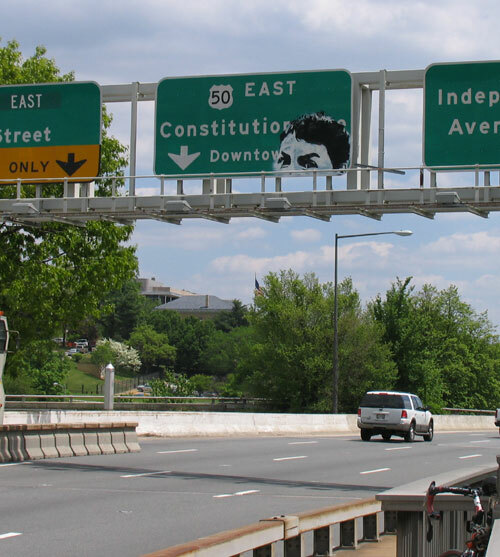 Depicted above is his most daring display, on the Roosevelt Bridge leading into DC from northern Virginia. Stories on the arrest at DCist and WaPo. 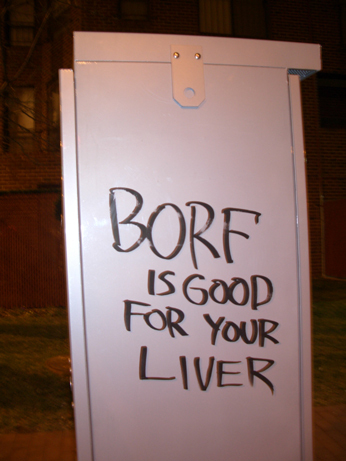 Background on Borf at goodspeedupdate.com (it's currently down) and DCist. Aside from the above instance, which might have obscured information necessary for those traveling into the city (and set a precedent for other bold graffiti artists), I have no problem with graffiti in cities -- DC or otherwise. It is a way for individuals to personalize the space of their city, and to say "I live here. I am not a businessman or an elected official; I may have no power, but I can leave my mark upon this place." I particularly like the small and simple graffiti tags on public structures like USPS mail boxes, phone booths, parking meters, etc. Again, it humanizes the government's attempt at sanitary, efficient, and seemingly heartless operation. The city of Philadelphia has a major, city-wide initiative to develop murals and celebrate the people. Much graffiti does this without the bureaucracy, being an immediate representation of individual spirit (though I think the mural program is valuable). In addition, some graffiti can be exceedingly clever. I personally like the bunny on the side of the Main St. Party Shoppe in Ann Arbor because it is so incongruous -- someone tagging a wall painted a bunny? Why? Again I refer to Sam Bass Warner's idea of the importance of "small patterns," or Jacobs' imploring that the small, personal and local is superior to the large, unified, and impersonal in the weave of urban fabric. The more people that are actively involved in shaping, building, decorating, and participating in the city, the richer urban life will be. UPDATE: Wow. It seems like people just don't get it. I think it's particularly interesting how orthodoxy can govern even a marginal form of expression, ie the guy who wants to see "something more mature." Like a wall mural, I suppose. UPDATE 2: Thanks to Madison House all-around good guy, Chris, for the bunny pic. Dale, where exactly is it at? I'm gonna take a stab that it's on Main Street somewhere, but where? North, south, cross-streets, etc. I've got tons of flicks of graffiti around here and taking one more would not be a problem. And I wouldn't mind talking to you and B-Zwag about your opinions on graffiti seeing that both of you have a hand in creating cities and the way they look. Main St. Party Shoppe is on Main and Ann. The bunny is on the west end of the building (towards the parking structure), visible from the Main St. sidewalk.